Life Before the Dinosaurs: Halkieria. Halkieria is an animal from the Cambrian Period that has been found in almost every site with middle Cambrian fossils. It had two shell-like plates, one in the front and one in the back. Halkieria was very slug-like, and probably related to Wiwaxia. 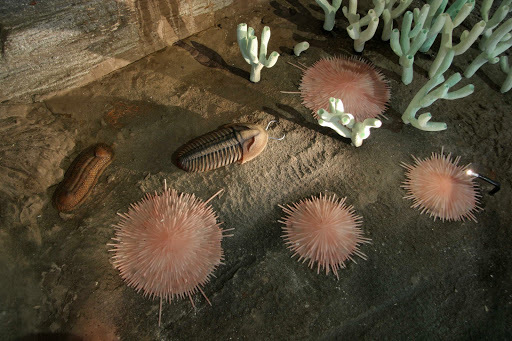 This image shows Halkieria (on the left) along with the flat disk-like sponge Choia, the bush-like sponge Vauxia, and a trilobite. Halkieria probably moved across the seabed like a snail. Some fossils of Halkieria show it rolled up like a pillbug. This may have been for defense. It was up to three inches long. Halkieria's shell-like plates had growth rings, like modern day clams. Its body was covered in sclerites (scale-like things that cover halwaxids) like its relative, Wiwaxia. Nice art, well rendering of this rather few known molluscomorph.